APPLICATIONS (at www.lovinliferescue.org) TAKE PRIORITY OVER EMAIL INQUIRIES. *** You will be contacted if you are a potential match. Contact could take up to 48 hours (Volunteer organization)*** Meet WOODROW! 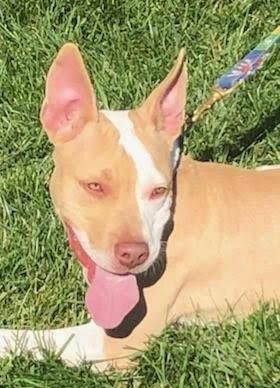 This gorgeous pup with stunning light green eyes is a 10 month old (approximate), male, 30 lb, Bull Terrier mix (just a guess). Imagine our surprise when we saw this baby on deathrow! Woody is darling and such a GOOD puppy!! He is SUPER friendly with every person he meets and he loves to give hugs! He is good with other dogs (lives with 3) and is crate trained. Woody is an active, fun-loving puppy and needs training, but he is as smart as a whip and learns quickly! He is already making progress learning how to walk well on a leash and knows "sit". Woodrow has not had one accident in his foster home! He is such an affectionate sweetie and will curl up right in your lap! This little love is sure to find his Forever Family quickly, so fill out our application soon! ***TRAINING IS MANDATORY FOR ALL LLR ADOPTABLES!! NOTE: We do NOT adopt out of state. Our range is no further than 40 miles North / Northwest from Chicago and 25 miles South from Chicago. This is because we PERSONALLY do home visits for every single dog / puppy. Exceptions ONLY in certain cases where a sweetie has issues (medical / behavioral / special needs) and we have had him / her for a longer time. We will then travel to the Moon for a Forever Family! Lovin' Life Rescue is a Chicago-based, young, 501(c)(3) non-profit, GREEN, companion animal rescue organization with a no-kill policy. United and inspired by our compassion for all animals, we focus our talents and previous rescue experience on saving innocent dogs and cats that are homeless, neglected or abused. In addition to supporting and participating in spaying & neutering, our contribution to helping make Chicago a No-Kill city is to educate the community with the simple mantra that Pets are Familyâ¦ they are not disposable. We actively advocate local concerns, focusing in particular on dog-fighting issues and education, as well. Lovin' Life Rescue adopts our dogs and cats to homes in Chicago and the surrounding suburbs (within a 50 mile radius). Lovin' Life Rescue is dedicated to finding Forever Families for our precious dogs & cats. Our adoption process is set up to make sure that our sweetie is the right match for you. If you are interested in adopting, please follow our required procedures: You must be at least 24 years old. Fill out an application. (This helps us learn more about you to determine if your lifestyle is the best fit for the potential âadopteeâ.) Participate in an interview with an LLR Adoption Counselor. Schedule a Home Visit with an Adoption Coordinator. (This is to ensure the home is safe for the animal.) Sign an Adoption Contract and make a tax deductible Adoption Fee Donation. This amount varies and starts at $350 for dogs & puppies, $125 for cats & kittens, and $100 for kittens being adopted as a pair. Additionally, kittens must either be adopted as a pair or must go to a home with another cat. All of our sweeties are microchipped, spayed / neutered, fully vaccinated, heartworm tested, FIV & Feline Leukemia tested, and treated for parasites (worms, fleas, mites, etc.). NOTE: We are a small, volunteer organization and receive many applications. You will be contacted only if we feel you are a potential match. Thank you for understanding.